Facial oils are having a major moment in skincare right now. Nearly every major skincare brand out there has their own oil mix that, unfortunately, often comes with a hefty price tag. My major problem with commercial facial oils is that the beneficial ingredients touted by the product are often diluted down by caprylic/capric triglyceride (emollient), jojoba oil and/or olive oil (carrier oils). These ingredients are still beneficial for the skin, but I refuse to pay $40+ for products that are comprised mostly of solvent or carrier oils. My solution for the past 6+ years has been to use pure oils. It's a lot less expensive and I get all of the benefits of that oil without dilution. For the record, I have sensitive and combination/dry skin. 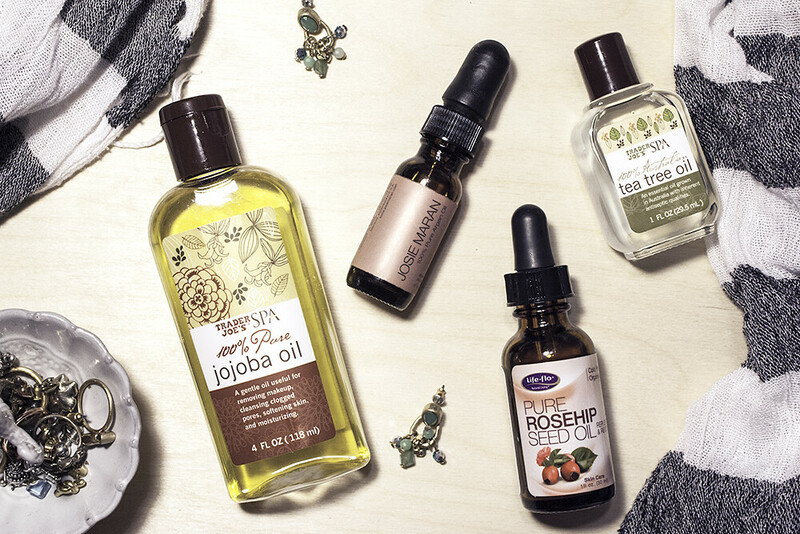 These are my top 4 oils that moisturize, soften, and don't break me out. Argan Oil If you're only going to buy one, pick argan oil. This is great for skin and hair. I put a lot of this on when my skin is acting up and let it soak in under my regular moisturizer overnight. In about 2 days, my skin is usually recovered. I pat this on when my skin is damp post-shower or after a hydrating mist. The Josie Maran argan oil is overpriced so I just refill the bottle with an alternative brand. As long as the oil is organic, cold pressed, and 100% argan oil, you're golden. 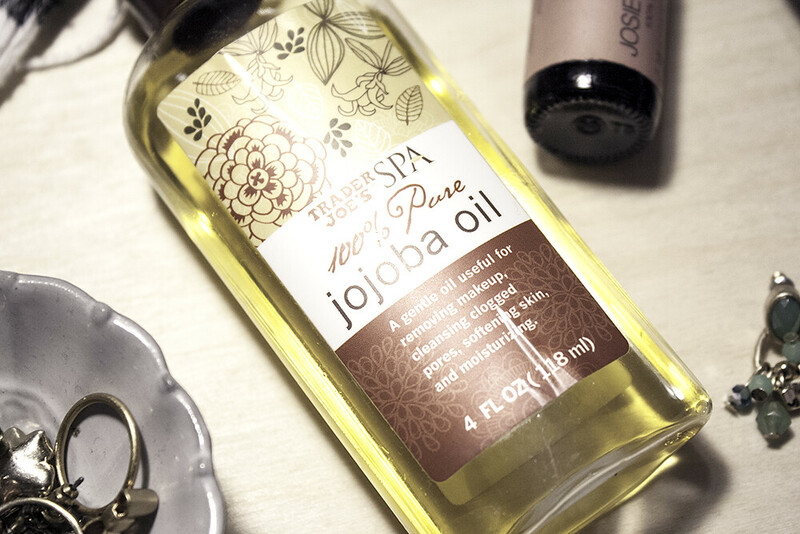 Jojoba Oil I get my jojoba oil for $7.99 at Trader Joe's, but you can find it at most health shops for about the same price. I like to mix this with argan oil sometimes to change things up a bit for my face. I also mix this with my body lotion to get even more moisture in the winter. The mister even uses a 50/50 mix of jojoba/argan + drops of essential oils for his beard! 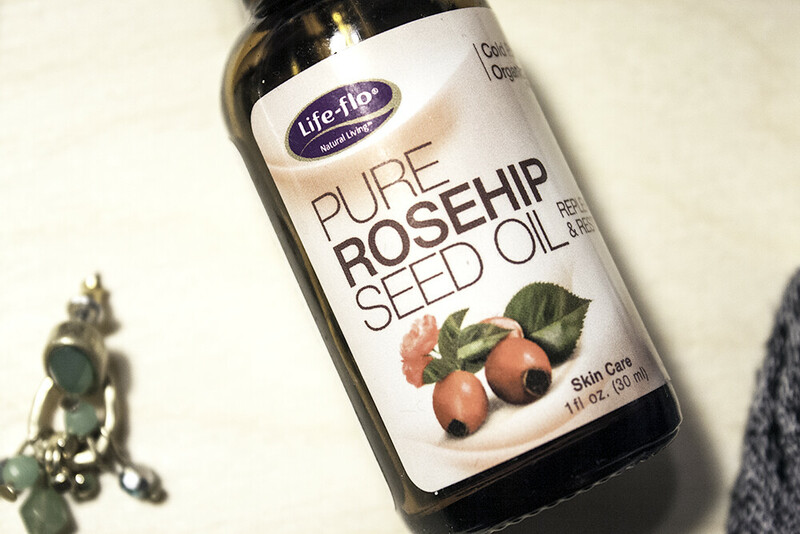 Rosehip Seed Oil I alternate between rosehip seed oil and argan oil as my primary facial oil. This one has a unique scent to it that might not be for everyone. I use this the same way I use my argan oil: patted on to clean, damp skin. It's lighter than argan oil and a good day time alternative. My skin feels immediately silky after putting this on. Tea Tree Oil I only use tea tree oil when I have blemishes. I prefer it to salicylic acid or benzoyl peroxide containing face washes. I dip a clean cotton bud in and just dot it onto the areas that need it. I don't find this drying and it does the trick! Honorable mentions: coconut oil and avocado oil. I like coconut oil for makeup removal or slathered on right after a shower. Thus far, I have found avocado oil really moisturizing, but haven't determined whether it caused a few small blemishes (it is slightly comedogenic). Either way, they're both excellent for body, if not for face. I'm looking into grapeseed and sweet almond oil next! TEA TREE OIL. That's where it's at; I've heard so many good things about it but for some reason I have such a hard time finding it (or I'm just lousy at searching). I don't really use oil for my face, and I don't really know why that is! I use a ton of the oils you mentioned in my hair though, and my hair loves it! My oil mix uses grapeseed oil as my carrier oil with avocado, coconut and peppermint mixed in. I do want to try including argan oil in my skincare routine - your review has sold me! I love tea tree oil for my spots and it clears them up so quickly. I'm currently using rose hip oil and am quite enjoying it. I am a huge fan of using oils for my face, although I am still not sure if they really work for my skin type or not - I go back and forth between thinking they are breaking me out or working wonders, lol! I totally forgot though, about how amazing tea tree oil is for healing pimples! Definitely need to get my hands on some again! You've reminded me that I have some little mini oils that I was gifted for Christmas - I'm sure Rosehip/Avocado and Argan oil were some of the ones included! I actually use a Rose Otto facial oil and Clarins Lotus face oils which I love - they're so deeply moisturising, I love them! I am trying to find a really good oil cleanser for my face right now since I also have occasional breakouts. Rose hip oil and argon oil is something I haven't tried in combination, but sounds like it would be easy to do. My current go-to is salicylic acid and occasionally benzoyl proxide, but they are a bit harsh for my sensitive skin, and unfortunately tea tree has dried out and caused a burning sensation. Might have to dilute that one or find it in products in smaller doses. Yes! Exactly what I need! Besides Trader Joe's, do you have links to where I can buy it (in-store or online)? Your posts are great! And I'm glad that finally a chemist who understands these chemicals are giving suggestions!